Preheat the George Foreman Grill to 190°c. Arrange courgette, bell peppers and onion slices on Grill Plate. Season with salt and black pepper. Cook 4-5 minutes, until tender. Remove vegetables and set aside. In a medium size bowl, mix mozzarella cheese and parmesan cheese. Spread about 1/3 of the heated pasta sauce in ungreased deep dish baking plate. Top with two lasagne sheets. 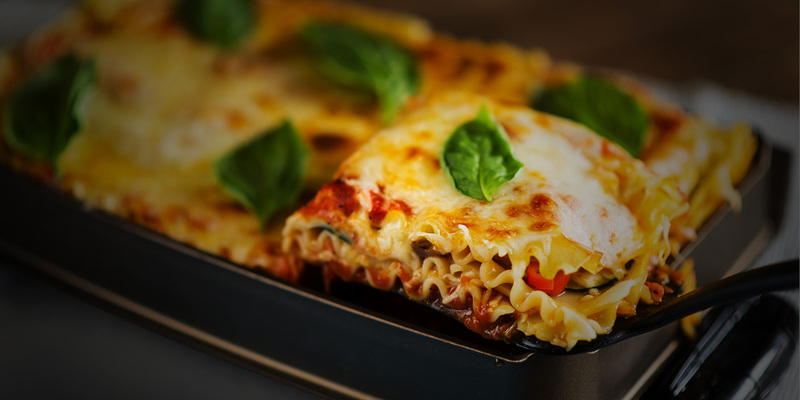 Spread about ¼ roasted vegetables over pasta sheets and top with ¼ of the mozzarella/parmesan cheese mixture over the sauce. Repeat layers two more times, ending in cheese. Place deep dish baking plate on bottom of grill. Close lid. Set the baking time for 20 minutes and temperature to 190°c. Bake until hot and cheese is melted and golden.